A new blood sport television channel launched in the United Kingdom has been criticized for showing recreational killing of wild animals or trophy hunting in Africa. My Outdoor TV (MOTV) is owned by Arsenal football club majority shareholder, Stan Kroenke, who has been on the receiving end of criticisms since the launch of the channel over the weekend. Animal rights groups and some section of the public condemned the channel that shows regular hunting programmes including killing of elephants, lions and other wild game primarily in Africa. Some of the shows include killing with bow and arrows and guns by professional and amateur hunters who pay a lot of money to be involved in the blood sport. 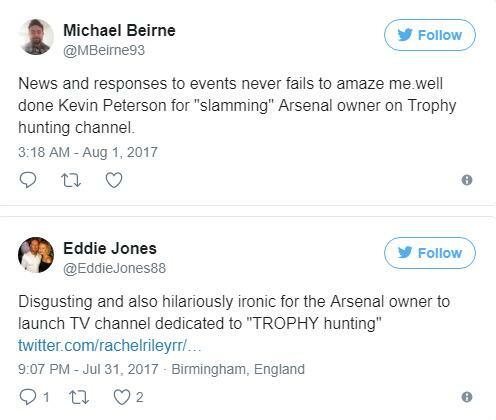 Critics say the sport in itself is unethical and showing it on the channel is “sickening”. Spokesperson of the channel, Simon Barr, has defended the programmes saying they will show only ethical hunts of elephants and other animals. Supporters of trophy hunting argue that the tens of thousands of dollars paid for the sport go toward conservation efforts. The International Council for Game and Wildlife Conservation (CIC), a non-profit organisation that advocates for conservation and hunting, says that the sport is an important tool to combat one of the biggest threats to African wildlife. They argue that so long as local communities benefit in some way from hunting funds through jobs, payouts, or development projects they are far less likely to poach wildlife that they view as destructive to their livelihood. This month, the son of the popular lion – Cecil the lion – was killed by trophy hunters just outside the Hwange national park in Zimbabwe despite wearing a GPS tracking collar fitted by scientists studying the lion. Xanda, who was six years old, was killed close to where his father was killed in 2015. Trophy hunting is legal, but comes with a lot of restrictions including the type of animals to kill, weapons to use and where to kill them. Despite these restrictions, many people illegally hunt animals, while others engage in poaching which is illegal.